Pineapple is an excellent source of vitamin C, and it owes some of its tartness to a host of digestive enzymes that occur naturally in the fruit. Unfortunately, these enzymes and vitamin C can both contribute to diarrhea. However, as long as you don't eat too much pineapple and have no underlying conditions that might contribute to your symptoms, pineapple should not cause diarrhea. A 1/2-cup serving of pineapple provides approximately 52 percent of a woman's and 44 percent of a man's daily vitamin C needs. As a result, eating too much pineapple can easily lead you to exceed your daily requirements. This is particularly true if you are using supplements and regularly consuming other excellent sources of vitamin C. As diarrhea and other digestive problems are the most common signs of eating too much vitamin C, this is one way that pineapple might cause diarrhea. Bromelain is an enzyme in the fruit and stem of pineapple that helps to break down protein. Because of these digestive properties, diarrhea and digestive issues are among the most common potential side effects of consuming too much bromelain. Interestingly, however, a 2012 article in "Biotechnology Research International" indicates that bromelain might help to treat diarrhea. 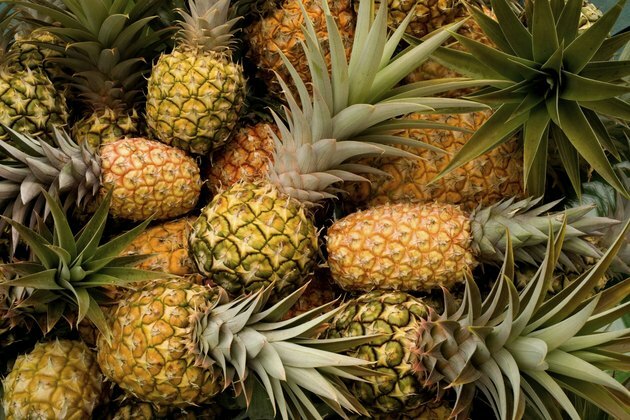 As this enzyme interferes with the diarrhea-causing pathogens E. coli and V. cholera, eating pineapple might actually help you to recover from some diarrhea-causing infections.